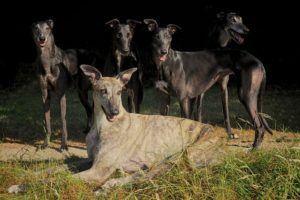 Traumatised greyhound Gemma has learned to love again – with the help of her two four-legged friends. The two-year-old dog was so badly treated because she refused to race, that she became petrified of people. A man who left four dogs to starve to death has been banned for life from keeping animals. Four dogs starved to death and two others suffered ‘gross neglect’ at the hands of their owner who left them in atrocious conditions for weeks, a court heard on Wednesday. The above does not include all recent activity by Carr who operated under the name Osiris Greyhounds. Two videos include a more recent mating and there are further greyhounds that are/were owned by Osiris Greyhounds and registered with the ICC. BBC 5 live recently ‘adopted’ a racing greyhound. Showme Thebunny is a 2year old female who is being raced at Owlerton stadium (Sheffield). On 19 August the Colin Murray show featured live coverage of the greyhound’s inaugural race. The commentators joked as the dog was bumped during her race and finished fourth. No mention was made of the fact that running dogs on an oval circuit will frequently result injury and sometimes death. The commentators were more concerned with pointing out that a bump can lead to lost ground that cannot always be made up. It is irresponsible for the BBC to once again promote greyhound racing in such a flippant way. Many will remember the Dara O’Briain part owned dog Snip Nua that was featured in the BBC programme Three Men Go To Ireland. Snip Nua’s appearance was broadcast several weeks after she was put down due to a career ending injury. The BBC failed to ever publicly acknowledge that Snip Nua had been destroyed and the corporation is once again misleading the public on the ‘sport’ of greyhound racing by at the very least being economical with the truth. The racing industry is viewing the BBC’s ‘adoption’ of Showme Thebunny as a great PR coup and to counter this please ask the BBC to provide 5 live listeners with the following information. (1) The Greyhound Board of Great Britain have to date chosen not comply with a key recommendation within a Parliamentary Group report for the industry to publish injury data. (2) The racing industry sanctions the destruction of injured and redundant dogs on economic grounds, hence dogs who suffer career ending but treatable injuries are routinely destroyed. (3) British tracks fuel the breeding of about 17,900 greyhounds annually while in stark contrast the homing figure annually stands at about 7,500. These are just three points of concern about greyhound racing that 5 live listeners should be made aware of. A greyhound trainer who pumped his dog full of Viagra to make him ‘run his head off’ at unlicensed races has been banned from keeping dogs for life. Two animal welfare organisations have said they do not support the reopening of Walthamstow Stadium as a dog racing venue – following claims they were working on such proposals. The idea on the part of the Dogs Trust that one can “ensure the cradle to grave health and welfare of the dogs that train or race at the track” is of course nonsense. Equally ridiculous is the notion held by LACS that an oval greyhound track can be made safe for dogs participating on it (stated by LACS in a recent email). AFG wonder if the interests of the greyhounds are best served when guidance on welfare is sought from groups that are clearly lacking a comprehensive understanding of such matters. That said what has welfare got to do with Morton seeking dialogue with either group? Advocates around the world, concerned about the suffering and slaughtering of greyhounds after their racing days end, met Saturday and yesterday for the fifth annual International Greyhound Welfare Conference. After the Centre forbid bull racing that was an integral part of rural games in Punjab, two animal welfare non governmental organisations (NGOs) have now urged the Punjab government to ban Greyhound racing in the state. Beauty without cruelty( BWC) and Care for animals and protection of environment( CAPE) India have written to deputy chief minister Sukhbir Singh Badal asking him to put an end to the sport in Punjab.